Geneticists at Oxford University are making the astounding claim that a mere 8.2% of our DNA does something biologically important. That means upwards of 90% of the human genome is "junk" — a discovery that could dramatically hasten genetic research. As a concept, junk DNA emerged in the early 1970s. The idea became famous at the close of the Human Genome Project in the 1990s, when researchers noted that over 98% of our genome had no apparent purpose. But results from the 2012 ENCODE project suggested that 80% of what was thought to be junk, or noncoding, DNA did in fact have some kind of biochemical function. Consequently, the concept started to fall out of scientific favor, but there's been a renewed push to see it reaffirmed. Earlier this year, for example, geneticists Alexander Palazzo and T. Ryan Gregory compellingly showed just how useless much of our DNA really is. Now geneticists Chris Rands and Chris Pointing from Oxford's Medical Research Council's Functional Genomics Unit have taken this line of thinking even further by claiming that just 8.2% (~7.1-9.2%) of the human genome is actually functioning in a biologically meaningful way — the code responsible for making us who we are. The reason for the junk DNA controversy, they say, is on account of inappropriately broad definitions of what's meant by "functional" DNA. They argue that just because an activity on DNA occurs, it doesn't necessarily have a consequence. But this isn't just an academic argument about the nebulous word "function". These definitions matter. When sequencing the genomes of patients, if our DNA was largely functional, we'd need to pay attention to every mutation. In contrast, with only 8% being functional, we have to work out the 8% of the mutations detected that might be important. From a medical point of view, this is essential to interpreting the role of human genetic variation in disease. To reach these conclusions, the researchers used a computational approach that allowed them to discern which activities matter and which do not. They identified how much of our genome has avoided accumulating changes over 100 million years of evolution — an indication that this DNA matters and that is has some crucially important function that needs to be retained. Specifically, they compared the complete DNA sequences of various mammals, from mice, guinea pigs and rabbits to dogs, horses and humans. The researchers looked at where insertions and deletions of chunks of DNA appeared in the mammals' genomes. "Throughout the evolution of these species from their common ancestors, mutations arise in the DNA and natural selection counteracts these changes to keep useful DNA sequences intact," noted Gerton Lunter. Their works shows that not all of the 8.2% is equally important. A mere 1% of human DNA accounts for the proteins that carry out nearly all of the critical biological processes in the body (in other words, 99% of the human genome does not encode proteins). The remaining 7% is thought to be involved in the switching on and off of genes that encode proteins; these genes, which are the control and regulation elements, operate at different times in response to various factors and in different parts of the body. "The proteins produced are virtually the same in every cell in our body from when we are born to when we die," noted Rands. "Which of them are switched on, where in the body and at what point in time, needs to be controlled — and it is the 7% that is doing this job." The team is not entirely sure why so much of our DNA is redundant, but Pointing says we could "snip away" most of our genetic information and we would still survive. If he's right — and that's a big if — we could theoretically reduce our genome from the two billion DNA letters to about 250 million. That's substantial. But Pointing needs to be very careful about leaping to such conclusions, not least of which because it's way outside the scope of this study. 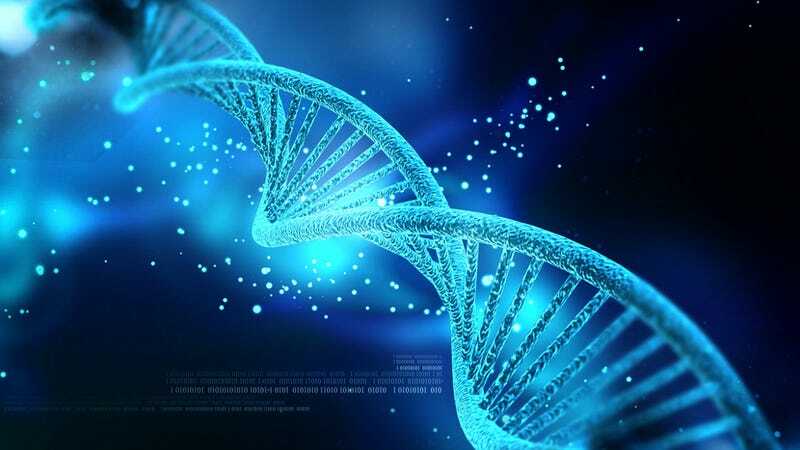 It's still very possible that the noncoding or non-functional segments of DNA are indeed performing some kind of peripheral, but essential, biological function, such as spatially separating the active DNA so that essential biochemical reactions can occur. We simply do not know what would happen to the remaining 10% of DNA — and how it would be expressed — if we simply "snipped away" 90% of our genome. It's also important to point out that this was a comparative analysis of mammals, and that it ultimately relied on extrapolations of data. This debate is far from resolved. Still, Pointing's note about the expedited treatment of genetic diseases is very well taken. Thanks to this work, geneticists can start to focus on the important parts of our genome. Read the entire study at PLOS Genetics: "8.2% of the Human Genome Is Constrained: Variation in Rates of Turnover across Functional Element Classes in the Human Lineage".